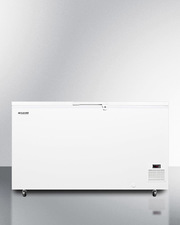 SUMMIT COMMERCIAL SCFF236 is the ideal reach-in freezer for any commercial, institutional, medical, or laboratory establishment in need reliable and user-friendly storage. The SCFF236 utilizes frost-free operation, eliminating the need for any manual defrosting. The 23 cu.ft. interior is constructed entirely from stainless steel for maximum durability and improved sanitation. An oversized, factory balanced refrigeration system maintains the ideal conditions for frozen food or other items designed to be stored between -8º and 0ºF. This unit has a bottom compressor that uses environmentally-friendly R290a refrigerant. It is ETL-S listed to NSF-7 commercial standards. Sized at 29" wide, the SCFF236 features a complete stainless steel exterior and sealed back design for easier cleanup. The door is self-closing to help protect stored items, but will stay open when pushed to 90º, making it easier to load and unload the unit. Pre-installed casters make it easier to move the freezer when needed for cleanup, with locking brakes to keep it in place. The SCFF236 features a cantilevered shelving system, allowing you to set the heavy duty wire shelves to virtually any position to accommodate a range of sizes (including baking pans). A digital thermostat gives you accurate control, with an external temperature readout so you can adjust settings without even opening the door. Interior lighting and a front-mounted lock are also standard. 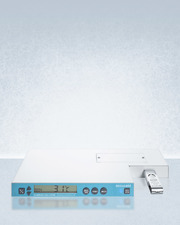 The SCFF236 can be perfectly matched to its refrigerator version, the SCRR231. With its advanced engineering and durable design, this commercial grade freezer is ideal for a variety of storage applications in commercial and institutional settings. NOTE: This unit must ship via white glove delivery service. For more information, contact your Summit sales representative.